15 min walk to Vatican and 12 mins to museum. Rooms spacious and comfortable beds. The apartment size was adequate for 6 people. Cool and rustic elevator. Close to vatican city and metro station. Host is very good and approachable any time. It is in the nice neighbourhood, near bus and metro station and very close to Vatican. The apartment is spacious and very functional, with two bathrooms. The apartment was in close proximity to public transport and the Vatican City. Very comfortable, clean, spacious. It has all the necessary amenities. Assolutamente nulla può piacere in questo alloggio: pessimo è dir poco! Punteggio zero! La struttura è accogliente, spaziosa e molto carina. Ideale per trascorrere qualche giorno nella capitale, a pochi passi dal Vaticano: infatti gode di un’ottima posizione, vantaggiosa anche per la sua vicinanza alla fermata metro “Ottaviano”. Il personale è cortese, nonostante ci siamo sentiti solo telefonicamente. Vatican Maison is located in Rome, 1.3 miles from St Peter's Square and 1.6 miles from The Vatican. Located around 1.7 miles from St. Peter's Basilica, the guesthouse with free WiFi is also 1.7 miles away from Castel Sant'Angelo. Piazza del Popolo is 1.7 miles from the guesthouse. At the guesthouse, all rooms include a closet, a flat-screen TV and a private bathroom. Vatican Maison provides certain rooms with garden views, and the rooms include a coffee machine. Guest rooms will provide guests with a fridge. Vatican Museums is 2.4 miles from the accommodation, while Via Margutta is 3.3 miles away. Ciampino Airport is 12 miles from the property. When would you like to stay at Vatican Maison? 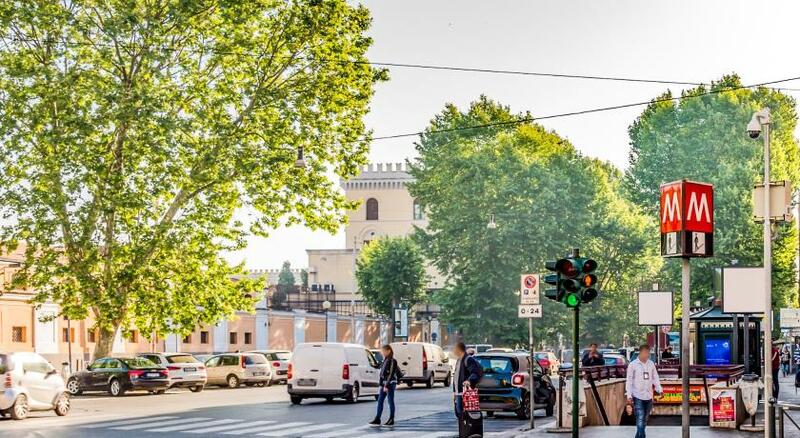 Vatican Maison it's the perfect balance between design and comfort, located close to the Vatican and few minutes walking from Ottaviano metro station in a very elegant and safe neighbourhood it's the best place you could choose to enjoy Rome! House Rules Vatican Maison takes special requests – add in the next step! Vatican Maison accepts these cards and reserves the right to temporarily hold an amount prior to arrival. We don’t have a key interring the scala V.
A lot of damages.Dirty walls,bathroom tower with missing door,basin not working properly.First aid kit empty.Lights in baths inoperative. Very small showers, a little dusty, tricky parking in the area. When we checked in apt is still dirty and messy. They have not clean yet. We waited for a long time while the cleaner still cleaning rooms very uncomfortable for us we were very tired from travel coming from Venice .shower room doors are broken,stay open while showering water is coming out. We waited 40 minutes for the cleaners even after providing a check in time. The small bathroom was mouldy and leaked constantly. There was no shower screen on one shower and the tap handle would completely fall off. Marks and mould all over the walls, the kitchen pots and utensils were mouldy and disgusting. The kitchen is TINY and the ‘fridge’ is tiny (which we had to clean out) even after paying a huge cleaning fee. No washing machine.. There were stains on the bedding. I would not recommend a group of 7 stay here, it is definitely not big enough. The photos made this apartment look a lot nicer than it was.